Seems like Penguin Books is looking to expand their brand beyond straight out books these days. Not long ago I came across a nice set of postcards each done in the design of one of 100 of their popular books, and now I see that they’re doing travel gear along the same lines as well. 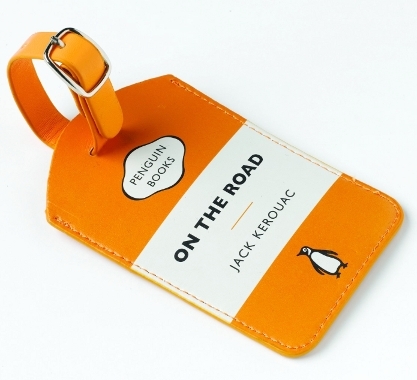 Like this luggage tag done in the classic Penguin Books style of orange and white with the little Penguin logo at the bottom. The book? On The Road by Jack Kerouac. Fitting, and it gives a while different dimension to the idea of a travel story.